The United States Securities and Exchange Commission (“SEC”) brought a successful Covered Action against a wrongdoer. Thereafter, the SEC’s Office of the Whistleblower (“OWB”) posted a Notice of Covered Action (“NoCA”) for that case. The Commission denied awards to all of the claimants because they did not satisfy the SEC whistleblower award rules. One of those rules requires that an award application must be filed within 90 days of the case being posted on the SEC’s NoCA list. Five individuals filed applications for SEC whistleblower rewards in the Covered Action. In separate Preliminary Determinations, the SEC’s Claims Review Staff (“CRS”) recommended not granting SEC whistleblower rewards to all five individuals. Three of those individuals did not contest the Preliminary Determinations. The other two appealed. The Commission entered an Order Determining Whistleblower Award Claim. That Order denied SEC whistleblower rewards to both of the two individuals who appealed their respective Preliminary Determinations. One of the two people who appealed had filed his or her application for an award in a timely manner. That person’s award was denied for failing to satisfy other SEC whistleblower award rules, as set forth in the Order. 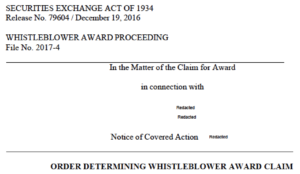 The second individual, identified as “Claimant 2” in the Order, did not file an award application until after the deadline set forth in the SEC whistleblower award rules had expired. According to the SEC’s Order, when the Notice of Covered Action was posted, it “expressly stated that an application for an award submitted on Form WB-APP must be completed and returned to the OWB” by a certain date. One of the reasons given in the Order as to why Claimant 2 did not receive an SEC whistleblower award was his or her failure to submit an award claim before the deadline expired. Apparently, Claimant 2 did not file an award application “until nine months after the deadline announced in the Notice of Covered Action”. The Commission cited two SEC whistleblower award rules that set forth the deadline to file award applications. The first one was Rule 21F-10(a), which says that award claims must be filed “within ninety (90) days of the publication of the Notice of Covered Action on the Commission’s website.” If a claimant fails to file an award application within this 90-day window “the claim will be barred”. The second of the two SEC whistleblower award rules cited in the Order was Rule 21F-10(b). That rule provides some additional clarification of the award application process. According to that rule, “in order to be considered for an award”, claimants have ninety (90) calendar days from the date of the Notice of Covered Action to file their award applications. The SEC whistleblower rules state that award applications must be made on Form WB-APP and filed with the SEC’s Office of the Whistleblower before the 90 days expire. The Commission found that “The record conclusively demonstrates that Claimant 2 failed to file a timely Form WB-APP”.